Large Nylon Collars For Big Dogs. The high quality 2 ply double layered nylon is the best a nylon collar can get. Strong yet soft with smooth edges for maximum comfort. 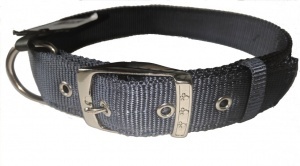 Each collar comes with a nickel plated buckle & D ring.